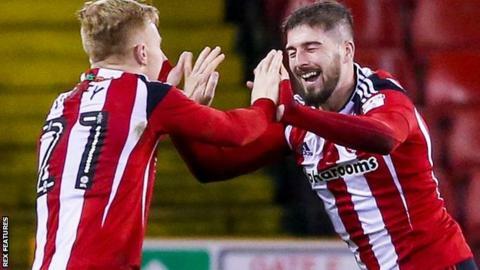 Jack O'Connell and Kieron Freeman scored in either half as Sheffield United extended their lead at the top of League One to seven points with victory over Millwall. Match ends, Sheffield United 2, Millwall 0. Second Half ends, Sheffield United 2, Millwall 0. Steve Morison (Millwall) is shown the yellow card for hand ball. Substitution, Sheffield United. Jay O'Shea replaces Billy Sharp. Attempt saved. Shaun Williams (Millwall) left footed shot from the centre of the box is saved in the bottom left corner. Corner, Millwall. Conceded by Jake M Wright. Foul by James Hanson (Sheffield United). Attempt missed. Lee Gregory (Millwall) right footed shot from the left side of the box misses to the right. Attempt missed. Paul Coutts (Sheffield United) right footed shot from outside the box misses to the right. John Fleck (Sheffield United) wins a free kick on the left wing. Attempt missed. Lee Gregory (Millwall) header from the centre of the box is too high. Substitution, Millwall. Aiden O'Brien replaces Tony Craig. Substitution, Sheffield United. Samir Carruthers replaces Mark Duffy. James Hanson (Sheffield United) wins a free kick in the attacking half. Attempt missed. Jed Wallace (Millwall) right footed shot from long range on the left is high and wide to the left. Attempt saved. Ben Thompson (Millwall) right footed shot from outside the box is saved in the centre of the goal. Corner, Sheffield United. Conceded by Tony Craig. Hand ball by Steve Morison (Millwall). Tony Craig (Millwall) wins a free kick in the attacking half. Goal! Sheffield United 2, Millwall 0. Kieron Freeman (Sheffield United) right footed shot from the left side of the box to the bottom right corner. Assisted by Mark Duffy. Attempt saved. Jed Wallace (Millwall) right footed shot from outside the box is saved in the centre of the goal.